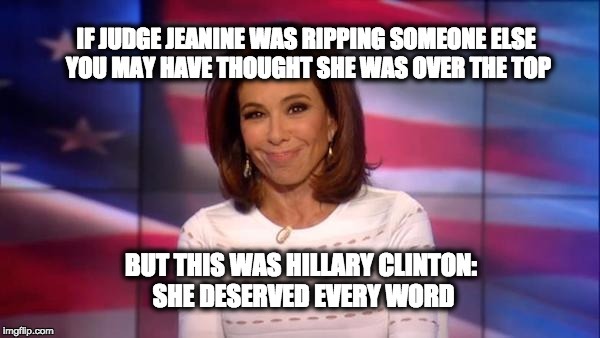 If Judge Jeanine Pirro wasn’t your hero before, well maybe she is now! Don’t let her perfectly styled hair and beautiful smile fool you, Pirro is a savage, and I mean that in a good way. If Judge Jeanine’s latest rant was directed toward someone else, one might think it was over the top. But this was directed at Hillary Clinton …she deserved every last word. While the liberal media may dance around and coddle Hillary Clinton’s fragile feelings, the judge will do no such thing. Pirro lays into Clinton, calling her out for playing the “poor me” card, and continuously creating excuses for her loss in the presidential election against Donald Trump. She says, “You are a loser, Hillary… Face it, and get back in the woods.” OUCH! Talk about ripping off the bandaid! “We’ve had it with you Clintons claiming victimhood,” Pirro said, after Clinton told an audience she would have been president if the election came before FBI Director Jim Comey sent an October letter to Congress. Pirro added that since Clinton previously took responsibility for her loss, she should stop blaming “boogey-men” like Comey and others. Pirro also said that Clinton was “damn lucky” for Comey’s recommendation, which suggest that Clinton not be she not be prosecuted for her email scandal.